This book is a miraculous account of the Polish death camp in which 750,000 Jews were murdered between 1942-43. It is most helpful in reminding us about the difference between the death camps and the concentration camps – the latter were forced labour camps whose inmates were mass-murdered towards the end of the war. The lesser known death camps such as Majdanek, Sobibor, Belzec and Treblinka were places where Jews were murdered on an industrial scale as soon as they arrived. Chil Rajchman was a Polish Jew whose quick wits in volunteering as a ‘barber’ and later as a ‘dentist’ enabled him to avoid immediate execution. Later he was one of the particpants in the Treblinka revolt in 1943, and one of the few rebels to escape without being shot. He wrote his chillingly detailed story in Yiddish soon after his escape. He lived, and married, in Uruguay where he died in 2004. 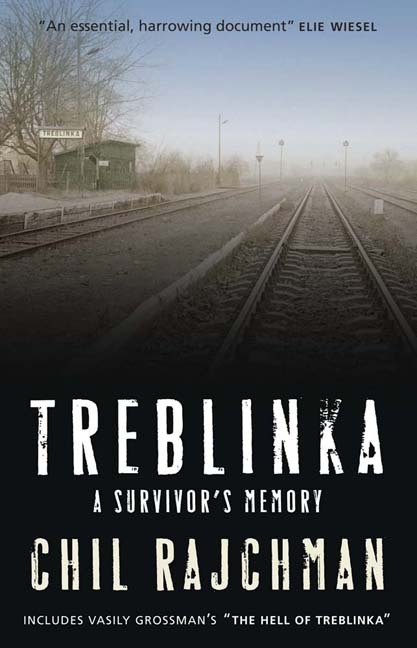 Treblinka was published posthumously in French in 2009 and has now been translated into English. It is sparse, short, horrifying and unforgettable. The book also includes another account of Treblinka by the famous Russian Jewish writer Vasily Grossman, author of Life and Fate. He was one of the Red Army soldiers who defeated the Germans in Poland, and wrote his reconstruction of the deathcamp for the Russian authorities. It is a brilliant piece of Russian anti-Nazi propaganda, but all too ironic for the modern reader who is aware of Stalin’s genocides. Get it. Read it. Share it. It’s an essential memoir. This entry was posted on 26 July, 2012 in homepage, Uncategorized and tagged Chil Rajchman, deathcamps, Niall McDevitt, Treblinka, Vasily Grossman. Bookmark the permalink.